7Although the dichotomy between the German and Yankee farmer regarding land tenure is presented in an ideal form, it does illustrate interesting differences between the two groups. The assertion here is that native American farmers in the nineteenth and early twentieth centuries were familiar with American law and that their behaviour regarding to land tenure and land transfer was based on national law. But how did the American environment affect land transfer strategies among European immigrant groups that arrived in the United States prior to the Civil War? 8Two main factors influenced the development of American land law: the American Revolution, and the abundance of land on the American continent. Due to the different systems of inheritance in England, both primogeniture and partible inheritance co-existed in the early days of the colonial period. On the one hand, English common law dictated primogeniture descent for the land whereas personal property was divided in equal shares according to the Statute of Distribution. On the other hand, partible inheritance was practiced from a very early date in most of New England. Following the American Revolution lawmakers in America disposed of European law regarding land ownership and inheritance. Instead, laws were reformulated into egalitarian provisions according to a developing tradition of individual rights, freedom, and progress. Influenced by republican ideas based on equality and liberty, the states of the union by 1800 had greatly modified the law of descent of lands by abolishing favoured treatment for eldest sons. In other words, the new legislative bodies held that personal property was to be distributed in equal shares to all children in place of the favouring of one heir. 11Consequently, the contrast between American individualism and European communitarianism is clear. But to what extent did the two cultures clash on the American scene? And how did these cultural conflicts influence customs tied to land tenure that European immigrants transplanted to the agricultural areas in the upper Midwest? 12Empirical evidence in part corroborates the difference in approach between the Yankee and the German regarding attitudes toward land and inheritance. Kathleen Neils Conzen in 1985 published a case study on land transfer strategies among German, Irish, and Yankee settlers in St. Martin Township in Stearns County in west central Minnesota. Frontier Minnesota conditions permitted German immigrant farmers and their children to maintain and revitalize traditional familial values through old-country strategies. These immigrants originated from areas in Germany where both partible and impartible inheritance were practiced. Immigrants from the Rhine Province, for example, hailed from a region where the imposition of the Code Napoléon ensured that sons and daughters inherited equally. Estates in this region were frequently distributed during the lifetimes of the parents, and their support in retirement by one or more co-heirs formed part of the settlement agreement. Those from Bavaria or Westphalia, on the other hand, came from an area where impartible inheritance prevailed. This inheritance pattern was characterized by open-field agriculture and larger, unified holdings where peasants lived on their own farms. Here, the parental couple and the single heir and his family shared a common residence, and non-heirs received compensation from the estate in forms other than land. 15Norwegian farmers in the upper Midwest illustrate that also other old European immigrant groups practiced inter-generational land transfers. We will first relate three central customs connected to inter-generational land transfers in Norway and to what extent these customs were transplanted to American soil. We will thereafter investigate to what extent these were adapted to an American environment. Source: Terje Mikael Hasle Joranger: “Emigration from Reinli, Valdres to the upper Midwest: A Comparative Study,” in Odd S. Lovoll ed., Norwegian-American Studies, 35 (2000), 153-196. 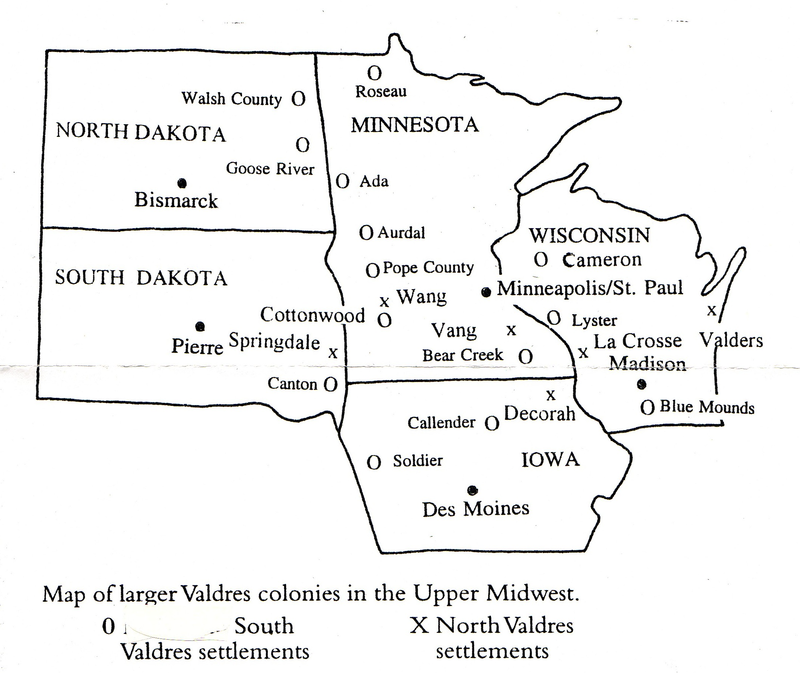 Figure 2: Map of Valdres colonies in the Upper Midwest. 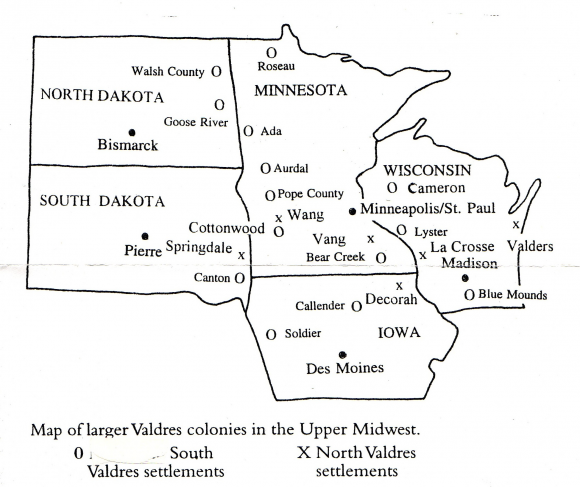 The two areas of study in the upper Midwest, the Blue Mounds settlement in Wisconsin and the Pope County settlement in Minnesota, are both marked on the map. Source: Terje Mikael Hasle Joranger: ”Emigration from Reinli, Valdres to the upper Midwest: A Comparative Study, ” in Odd S. Lovoll, ed., Norwegian-American Studies, 35 (2000), 153-196. 30The principles of the åsetesrett, the right of primogeniture and impartibility, were continued among Nowegian immigrants in America. The institution included the exclusive right of the eldest heir, in most cases a son or a daughter in case there were no sons, to assume ownership of the main property after the death of the parents. Equal to the Norwegian law of inheritance of 1854, legal provisions in the state constitutions of Wisconsin and Minnesota stated that children were to be treated equally in terms of inheritance to both real and personal property. The concept of primogeniture had been abolished in America by 1800, but the majority of Norwegian immigrants in this study continued this practice. Thus, the eldest son was favoured in a majority of instances as the farm heir in America as in Norway into the third generation. 33The focus on the male heir indicates that paternalistic traits were continued in America. The traits may be explained by the strong position of the male gender in the agricultural sphere. Yet tradition and law could clash in relation to family farm transfers. Legislation in America was based on egalitarian laws stressing an inheritance system favouring all heirs. However, egalitarian provisions that were transferred to newly established states such as Wisconsin and Minnesota following the declaration of the Northwest Ordinance of 1787 were not followed by the mainstream of Norwegian immigrants. Instead, they adhered to paternalistic and traditional land transfer patterns including the favouring of male heirs and the use of inter vivos transfers, thus replicating both the general pattern in Norway. This type of transfer in Norway strengthened the position of the heir following declining mortality rates and the pressure on available land through population growth. In American society, on the other hand, land was regarded as a commodity. Therefore the inter vivos transfer became a significant strategy to plan the transfer of the family property. 35The real and personal estate in all intestate cases in Pope County, Minnesota were distributed according to the state statutes in the period 1885-1972, that is, in cases where the deceased had not written a will. Persons who had drawn up a will, on the other hand, to a greater extent favoured certain family members, especially sons, instead of following the state statutes. Sons were also favoured by other ethnic groups. In several instances real estate was transferred to sons on the provision that they pay a cash sum to sisters. In several instances the spouse was favoured with all real and personal estate as long as she remained unmarried. Other relatives were favoured in almost an identical number of cases. The drawing up of wills, a casual business in America, was used in cases where the owner wanted to ensure that the widow or vulnerable family members like retarded siblings received a share of the estate. Intestate cases occurred in instances of unexpected death, family disorganization, or because a family could not agree on the division of property. Lastly, the liquidation of farms took place in instances where the parents wanted to sell their farm to an outside party. Both the drawing up of a will and intestate cases had to go through the probate system. 37The allodial right, or the odelsrett, defined by the rights of pre-emption and redemption, never had any equivalent in American legislation. Rather, findings from this study indicate that its old function in Norway was replaced by a mentality related to ensuring community stability, farm family persistency and a bond to the land in America. Both written and oral data material collected in connection with my study suggest that there was a pronounced wish by many to keep the farm in the family. Yet there was not a pronounced wish that the oldest son must be favoured as the farm heir. A Norwegian immigrant explained that all his sons insisted upon owning farm lands in America although only a few of them became farmers, largely for reasons of sentiment, in harmony with the old conception of land ownership.36 This sentiment could be a reformulation of the old Norwegian institution of odelsrett in an American environment where it was non-existent. In other words, the rights of pre-emption and redemption that marked the odelsrett institution in Norway could have been replaced by a mentality tied to farm persistency and attachment to land found among Norwegian farmers. 42Ostergren’s and Gjerde’s findings are coherent with the findings in this study. In all but four instances, the family attended the same Lutheran church for all three generations. In one case the change occurred in the second generation and in three of the cases in the third generation. The change in most cases took place where the person attached to the farm family studied attended the spouse’s church but in one case was influenced by the move of the farm family to the nearest town. In one of these cases the change occurred when the farmer married a German Lutheran girl and became a member of her church. Moreover, several interviewees said that the church promoted segregation, especially in the first and the second generations.41 Consequently, the findings of the study indicate that the local Lutheran church guaranteed social continuity. How do these findings relate to farm family persistency? 44To sum up, the ideal of the allodial right was brought over by Norwegian immigrants and adapted to a mentality tied to the love of the family farm, the love for a rural way of life, and a strong interest to keep the farm in the family. This adaptation was done through a continuous process of negotiation through the generations, thus changing its original meaning. 45The focus of this article is the relationship between American land law and the degree to which customs were transplanted from Europe in inter-generational land transfers. Norwegians were characterized by a rural bond and an attachment to the family farm. These traits were identical to cultural traits tied to German farm families in America. A third common trait between the two groups is the community formation around cohesive neighbourhoods based on common background down to the parish level. According to Robert Ostergren, land, from an entrepreneurial angle, was a material advantage and a source of speculation or quick profit where materialism outweighed communal and non-economical goals. In another sense, land was giver of life, symbol of familial accomplishment, independence and identity within community; here the ultimate goal was its orderly inheritance in the interest of maintaining family and community continuity.43 If we attribute the first attitude as a “Yankee” trait and the second choice as “German,” the Norwegians are closely identified with the latter. 46The three Norwegian customs of the allodial right, the right of primogeniture and impartibility, and the support agreement were never fully transplanted to American soil. Instead, they were reformulated in a new environment based on flexible and practical solutions among Norwegian immigrants and their offspring. Patterns of land transfer from strong and traditional freeholding regions in Norway that were based on the ties between family and land were meaningful for emigrants who left the homeland. Cultural traits that develop from the adaptation process must be understood on their own terms as Norwegian-American. They have ensued from a separate historical development through the negotiation and re-negotiation of identity between the immigrant and host society in a multicultural society. 1 Hildegard Binder Johnson, Order Upon the Land, The U.S. Rectangular Land Survey and the Upper Mississippi Country (New York, London, Toronto: Oxford University Press, 1976), 7-8. 2 Frederick Jackson Turner, The Frontier in American History (New York: Henry Holt, 1958 ), 1-5, 22-30, 127-156, 243-268; Jon Gjerde: ‘Forum: Immigration Hitory – Assessing the Field: New Growth on Old Vines – The State of the Field: The Social History of Immigration to and Ethnicity to the United States,’ Journal of American Ethnic History, 18 (Summer 1999), 41-46. 3 Albert B. Faust, The German Element in the United States (New York: Houghton-Miffin, 1909), 29 ff, cited in Jon Gjerde, ‘The “Would-Be Patriarch” and the “Self-made Man”: Marcus Lee Hansen on Native and Immigrant Farmers in the American Middle West’ in Birgit Flemming Larsen et al, eds., On Distand Shores: Proceedings of the Marcus Lee Hansen Immigration Conference, Aalborg, Denmark June 29-July 1, 1992 (Aalborg, Denmark, 1993), 36. 4 Joseph Schafer, ‘The Yankee and the Teuton in Wisconsin: I. Characteristic Attitudes Toward the Land,’ Wisconsin Magazine of History, 6 (1922), 142-145. 6 Marcus Lee Hansen, ”Immigration and Expansion” in The Immigrant in American History (Cambridge, Massachusetts: Harvard University Press, 1940), 53-76. 7 Gjerde, ‘The “Would-Be Patriarch,” 35-49. 8 Sonya Salamon, Prairie Patrimony: Family, Farming, & Community in the Midwest (Chapel Hill & London: The University of North Carolina Press, 1992), 1-9, 19-33, 252-255. 9 Carole Shammas, Marylynn Salmon, & Michel Dahlin, Inheritance in America from Colonial Times to the Present (New Brunswick & London: Rutgers University Press, 1987), 6-16, 24-44, 55-66, 83, 112-121; Friedman, A History of American Law (New York: Simon & Schuster, 2005), 20-25, 58-65. 10 Johnson, Order Upon the Land, 7. 11 Wisconsin Revised Statutes 1849, Chapter 62: 338, Minnesota Statutes 1867, Chapter XLVI: 353; Friedman, A History of American Law, 160-167; Shammas, Salmon, & Dahlin, Inheritance in America, 95-86, 236-251. 12 Kathleen Neils Conzen, ‘Peasant Pioneers, Generational succession among German farmers in frontier Minnesota,’ in Steven Hahn et al, eds, The Countryside in the Age of Capitalist Transformation (Chapel Hill: University of North Carolina Press, 1985), 259-285; Sonya Salamon, “Ethnic Differences in Farm Family Land Transfers,” Rural Sociology, 45 (Summer 1980), 290-308. 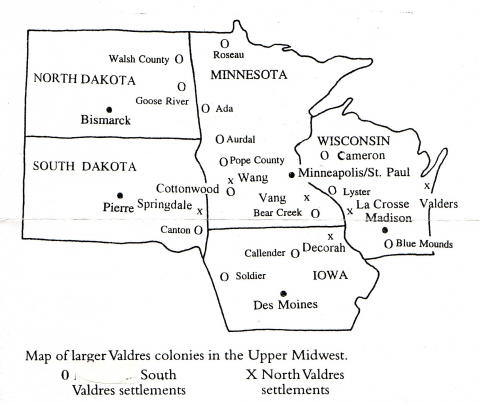 13 Walter D. Kamphoefner, The Westfalians: From Germany to Missouri (Princeton, New Jersey: Princeton University Press, 1987), 128-134; Robert C. Ostergren, “European Settlement and Ethnicity on the Agricultural Frontiers of South Dakota,” South Dakota History, 13 (Spring/Summer 1983), 49-82. 14 Myron Gutmann et al, ‘German-Origin Settlement and Agricultural Land Use in the Twentieth Century Great Plains,’ in Wolfgang Helbich and Walter D. Kamphoefner, eds., German-American Immigration and Ethnicity in Comparative Perspective (Madison, Wisconsin: Max Kade Institute, 2004),138-168; Salamon, ‘Prairie Patrimony,’ 21. 15 Odd S. Lovoll, ‘Norwegians on the Land’ in the series Historical Essays in Rural Life (Marshall, Minnesota, 1992), 1-2; Robert P Swierenga., “Ethnicity and American Agriculture,” Ohio History 89 (Summer 1980), 323-344. 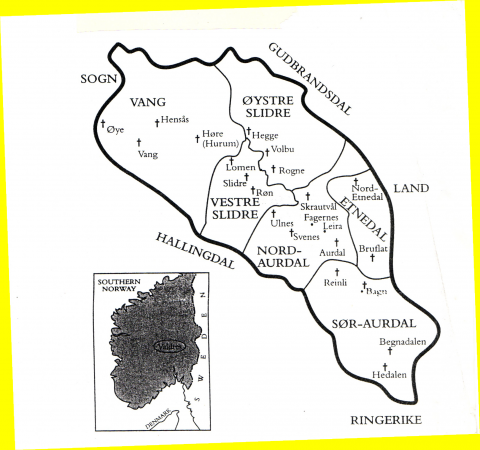 16 Brynjulv Gjerdåker, ‘continuitet og modernitet,’ Norges Landbrukshistorie, vol. 3, 1814-1920 (Oslo: Det Norske Samlaget, 2002), 165; T.A. Hoverstad, The Norwegian Farmers in the United States (Fargo, North Dakota: Hans Jervell Publishing Co., 1915), 11-12. 17 Birgitta Odén, ‘Emigrationen från Norden till Nordamerika under 1800-talet, Aktuella forskningsuppgifter,’ Historisk tidskrift, 83 (1963), 274-277. 18 Oscar Albert Johnsen, Norges bønder: utsyn over den norske bondestands historie (Oslo: Aschehoug, 1936), 301. 19 Rigmor Frimannslund, ‘Søstre fra Middelalderen og ny tid,’ in Tradisjon, 14 (1984), 74-78; Amund Helland, ‘Topografisk-statistisk Beskrivelse over Kristians Amt,’ vol. 5 b2 in the series Norges Land og Folk (Kristiania (Oslo): Aschehoug, 1913), 310. 20 Per G. Norseng, ‘Odelsrett: the Norwegian retrait lignager,’ in Tore Iversen & John Ragnar Myking, eds., Land, Lords and Peasants, Peasants rights to control land in the Middle Ages and the Early Modern Period Norway, Scandinavia and the Alpine region, Seminar Report, Department of History and Classical Studies, Norwegain University of Arts and Sciences (Trondheim 2005), 202. 21 Law of June 26, 1821 regarding the odelsrett and the åsetesrett (the Allodial Right, the Right of Primogeniture, and impartibility). The title reads the following in Norwegian: "Lov av 26. juni 1821 angaaende Odelsretten og Aasedesretten." The law was revised and modernized when the Norwegian Parliament passed the new "Lov om odelsretten and åsetesretten" on June 28, 1975. 22 Jon Skeie, Odelsretten og åsetesretten (Oslo: Gyldendal, 1950), 7; Harald Bjorvand et al, Våre Arveord. Etymologisk Ordbok (Oslo: Novus Forlag, Institutt for sammenlignende kulturforskning, 2000), 681. 23 Norseng, ‘Norwegian retrait lignager,’ 203-205. 24 Anders Frøholm, Gardar og slekter i Vang, vol. 1:B in Ivar Aars, ed., Valdres Bygdebok (Gjøvik: Valdres Bygdeboks forlag, 1990), 176-181; Harald Hvattum, Framgang, oppbrot og motstraumar. Valdresbygdene si historie 1800-1914, vol.3:2 in Ivar Aars, ed., Valdres Bygdebok (Fagernes: Valdres Bygdeboks forlag, 2004), 238-242. 25 Skeie, Odelsretten og åsetesretten, 15-16, 39-40; Norseng, ‘Norwegian retrait lignager,’ 215-216; Frimannslund, ”Søstre fra Middelalderen og ny tid,” 74; Gjerdåker, ‘Kontinuitet og modernitet,’ 114-115, 121. 26 Kjeld Helland-Hansen, Føderådsordningens historie i Norge, vol. 3, CD-ROM edition (Oslo 1997), 3-8, 22-23, 239-242. 27 Ibid., 391; Terje Mikael Hasle Joranger, The Migration of Tradition? A Study on the Transfer of Traditions Tied to Intergenerational Land Transfers among Emigrants from the Valdres region, Norway to the Upper Midwest and their Descendants for Three Generations, 1850-1980, PhD dissertation; Faculty of Humanities, University of Oslo, 2008, 363-400. 28 Joranger, The Migration of Tradition?, 3-5, 17-24. 29 Mark W. Friedberger, Farm Families & Change in Twentieth-Century America (Lexington, Kentucky: The University Press of Kentucky, 1988), 74-98. 30 Joranger, The Migration of Tradition?, 271-272. 31 Ibid., 275-286; Jon Gjerde, The Minds of the West: Ethnocultural Evolution in the Rural Middle West, 1830-1917 (Chapel Hill, North Carolina, 1997), 4-9.199-200. 34 Mark W. Friedberger, ‘Handing Down the Home Place: Farm Inheritance Strategies in Iowa,1870-1945,’ Annals of Iowa, 47 (1984), 518-536, Friedberger, Farm Families, 78-79; Joranger, The Migration of Tradition?, 254-255; Gjerde, The Minds of the West, 207. 35 Joranger, The Migration of Tradition?, 260-264; Friedberger, ‘Probate and Land Records in Rural Areas,’ Agricultural History, 58 (1984), 123-126; Pope County Probate Court, Final decrees of distribution, 1867-1982, filed June 7 1920, Minnesota Historical Society, St. Paul, Minnesota. 36 Knut Gjerset: ‘A Norwegian-American Landnamsman: Ole S. Gjerset,’ in Studies and Records, 3 (Northfield, Minnesota: The Norwegian-American Historical Association, 1928), 94, cited in Theodore C. Blegen, Norwegian Migration to America 1825-1860 (New York: Arno Press, 1969 ), 6. 37 Interview with male farmer, age 69, August 15, 1995. 38 Robert A. Ibarra and Arnold Strickon, ‘The Norwegian-American Dairy-Tobacco Strategy in Southwestern Wisconsin,’ Norwegian-American Studies, 32 (Northfield, Minnesota: The Norwegian-American Historical Association, 1983), 3-29; C.F. Midelfort and H.C. Midelfort, ‘Norwegian families,’ in Monica McGoldrick et al, eds, Ethnicity and family therapy (New York and London: The Guildford Press, 1982), 438-456. 39 Playford V. Thorson: ‘Scandinavians’ in William C. Sherman et al, eds: Plains Folk: North Dakotas s Ethnic History (Fargo, North Dakota: North Dakota Institute for Regional Studies and University of North Dakota, 1988), 190; The Glenwood Herald (Minnesota) June 17, 1910. 40 Robert C. Ostergren, ‘Land and Family in Rural Immigrant Communities,’ Annals of the Association of American Geographers, 71 (September 1983), 400-411, Gjerde, From Peasants to Farmers, 164-165. 41 Joranger, The Migration of Tradition?, 292-293. 42 Perry Historical Center. The Historic Perry Norwegian Settlement (Daleyville, Wis.: The Perry Historical Center, 1994), 156-169; Joranger, The Migration of Tradition?, 294-296. 43 Robert C. Ostergren, A Community Transplanted. The Trans-Atlantic Experience of a Swedish Immigrant Settlement in the Upper Middle West, 1835-1915 (Madison, Wisconsin: The University of Wisconsin Press, 1988), 262-263.